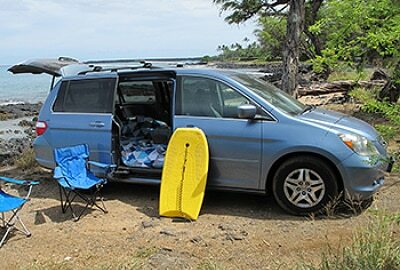 Our Maui Camper Van has all of the features of our classic campers, but with the safety and conveniences of a modern vehicle such as A/C, airbags and ABS breaks. Our reliable modern campers have enough power to climb Haleakala to camp, see the sunrise and hike all in the same day. The kitchen stove, cooler and water tank are removable so you can cook at the back of the camper or move everything to a camping table if you prefer. 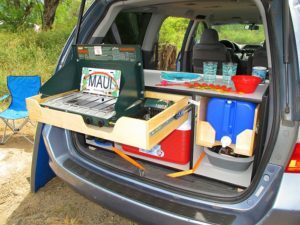 The Maui Camper has seating for four and a full-size bed for 2, also includes all the camping supplies you could need to have a great camping trip. See a list of inclusions below. THIS VEHICLE MAY ALSO BE RENTED AS A REGULAR 7 PERSON MINI VAN. You’ll blend in on island roads. Maybe you’ll even make new local friends! Which is very common. These book up fast, so don’t delay. Regular rates start at $115, but if you book long in advance, you can get better rates! To obtain a quick quote, go to the reservations page, enter your travel dates and select your vehicle and options. The quick quote will appear below in red. Fill out the guest information below to receive a detailed quote by email. 2. Is it ok to sleep in the campervan anywhere on the side of the road or by the beach? Unfortunately, it is illegal to camp anywhere on Maui that is not a designated campground or private property (with landowner’s permission). But there are plenty of gorgeous, safe, and conveniently located campgrounds around Maui! 1. Do you offer airport transfers? Yes we do. We offer airport transfers from one of our authorized transportation partners. The cost is $39 per transfer, for up to 2 people ($19 for each additional person), each way. Transportation fees will be billed at time of vehicle pickup. To arrange a transfer, fill out the information on this form at least 24 hours prior to arrival. 1. What is included in the campervans? The Westies come with two full-size bunk beds, a pop-up tent, a kitchenette with a sink and two burners, a 10-gallon tank of water, plenty of storage space, a cooler, bedding, cooking utensils and silverware, a coffee press, and much more. You can find the list of all that is included in the campervan here. 1. Can we do the road to Hana with the campervan? Absolutely! Actually, this is the most popular trip people take in our campers. There are three campsites on the way, so you can take your sweet time. Note that the camper-vans—just like all other rental vehicles on island—are not covered by insurance or roadside assistance on the 7 mile of unpaved section of the road between Kipahulu and Kaupo. This is due to the road’s bad conditions, and it being a very narrow one-lane road in some areas. Please use wisdom when traveling this road. 3. I want to use my own car insurance. How does it work? Your insurance must provide full coverage (liability, collision, comprehensive), as well as RV rental. EACH driver must provide proof of their own insurance (copy of your policy) upon vehicle pick-up. This option is only available to US and Canadian citizens. 1. What happens if our campervan breaks down? Pull over in a safe spot, and give us a call as soon as possible. We have 24/7 roadside assistance and will troubleshoot, repair, or replace your van as soon as possible. Please note that depending on where you are located, it might take us a few hours to reach you. Decline any offer from any friendly officer or by-stander to tow your vehicle, as towing must be arranged by us to be covered by the insurance. Note that if you find yourself in one of the travel restricted areas, you are liable for all damages to vehicle, tires, towing charges and other expenses resulting from a breakdown associated with operating in unauthorized areas.